Apple continues to seek patents for the designs of its one-of-a-kind flagship retail stores, with the latest application related to the curved glass roof of the Upper West Side location in New York City. The details of the Upper West Side store are revealed in a new patent application published this week by the U.S. Patent and Trademark Office entitled "Support Structure and Building Including Same." 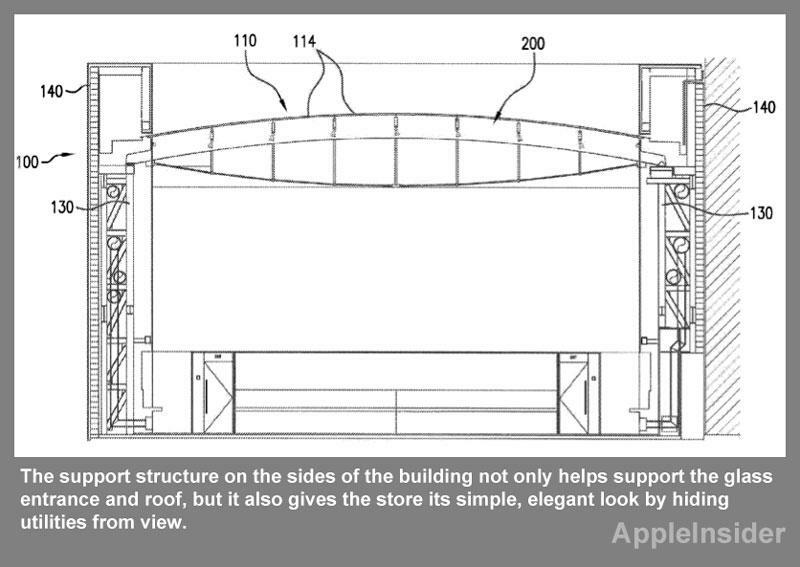 In particular, the filing concentrates on the curved glass roof that Apple has constructed at the New York store. The documents describe the support structure implemented at the store to support the massive glass structure that acts as both its front and its roof. The support structure on the sides of the building not only helps support the glass entrance and roof, but it also gives the store its simple, elegant look by hiding utilities from view. "In order to help maintain the glass look and feel of the building, building utilities can be routed through (the) support structure, hiding them from view and thereby preventing them from interrupting or interfering with the glass look and feel of the building," the filing reads. "To accomplish this, utilities can be routed within purlins." 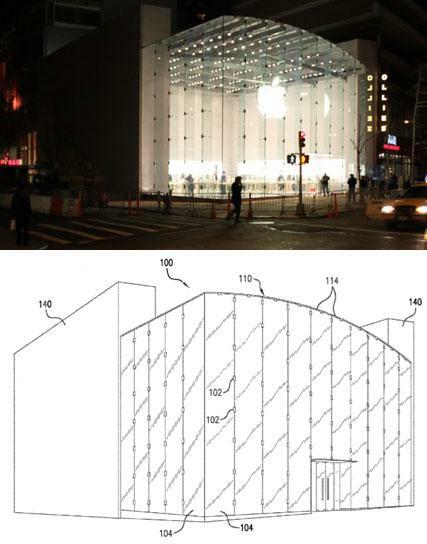 The latest filing comes a week after the USPTO also revealed Apple's intentions to patent the design of the huge class cylinder that serves as the entrance to its megastore in Shanghai, China. The underground retail location has an elaborate, 12-meter-tall cylinder assembled from a number of curved glass panels. Apple's Upper West Side store in New York City also features curved glass on its roof, along with a front entrance that is 54 feet tall, 75 feet wide and 30 feet deep, made primarily out of glass. It officially opened in November of 2009. A long list of inventors is credited with the design of the Upper West Side store. They are Karl Backus, George Bradley, Tim Eliassen, Timothy W. Gudgel, Scott David Hazard, Holger Krueger, Marcin Marchewka, Michael Mulhern, Patrick O'Brien, James O'Callaghan, and Yutang Zhang. For the last few years, Apple has focused primarily on building larger, more impressive stores that can accommodate the massive amount of foot traffic they attract. During the company's most recent quarterly earnings conference call, Apple officials revealed that Apple stores have an average of 18,000 visitors per store, per week, earning average quarterly revenue of $12.2 million per location.